Charles Omenihu helped the North Team win the Reese's Senior Bowl, and the former Texas standout is now set to compete in the State Farm All-Star Football Challenge Friday (Photo courtesy of texassports.com). 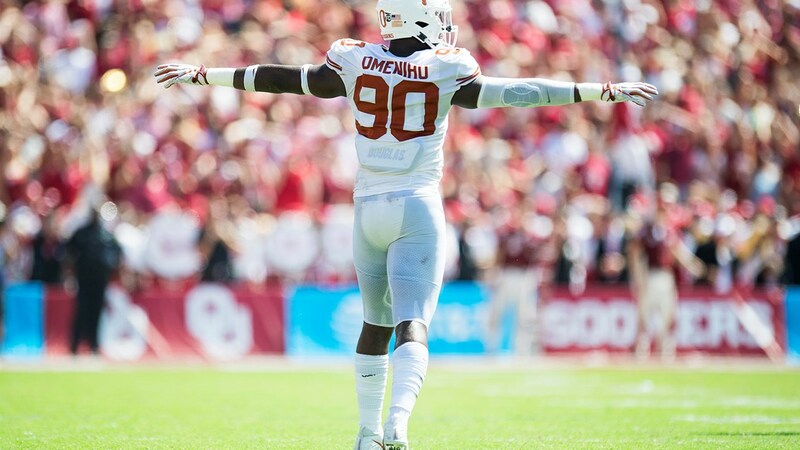 On his way to the NFL, former Texas star Charles Omenihu is providing a few more highlights for Horns’ fans — and the rest of the nation. The senior Longhorn made more than a name for himself during the 2018 Texas Football season, and is climbing up NFL draft boards after his performance in the Reese’s Senior Bowl over the weekend. Omenihu played for the North Team, which won the game 34-24 with a big hand from the Texas-Ex. With the North trailing the South Team 12-10 with a little more than nine minutes to play in the third quarter, Omenihu’s relentless pursuit and rush resulted in a forced fumble, which was recovered by the North side on the way to their comeback win. Current Oakland Raiders coach Jon Gruden coached the North Team, which also included Texas senior defensive back Kris Boyd, who had a tackle in the game. Omenihu finished with three tackles — including two tackles for loss — along with a sack and a quarterback hurry. Now, the defensive lineman has been picked to participate in the 2019 State Farm All-Star Football Challenge at AT&T Stadium in Arlington this Friday. The 21st edition of the All-Star Football Challenge airs on ESPN2 at 8 p.m. The skills competition will feature 24 of college football's brightest stars divided into six teams based on their conference. The format for the All-Star Football Challenge features players individually participating in a timed event, then finishing with a full team event. All events will be timed and have individual winners, which will compile into a cumulative score to determine the winning team.Individual events in the 2019 State Farm All-Star Football Challenge include: the State Farm QB Accuracy Competition, the Hands Competition, the Quicken Loans Lineman Strength Challenge and the Mercedes-Benz Obstacle Course. To conclude the program, the players will compete as teams in the State Farm Team Competition.